Very good, I must say. The other one was a bit dull and (no offense) amateurish with the jpegginess, but this one looks nice. May I suggest thinking of a different skin for when this theme is subbed out? The jpegginess and the lack of transparency killed me. The only thing I see now is how the sprites for the new and old topics icons are overlapping the text of the forum, which makes it harder to read. Very NICE, I am not going to say things twice but this is NICE. Ah, what are the Pichu icons for? The legend at the bottom of the forums only show what the Delibirds are. I have an idea for a new theme. 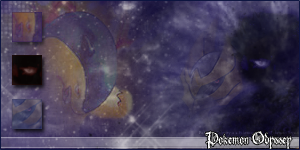 Keep the basic winter theme that animeFTW made, but mix up a little heart gold and soul silver with it. I can help with that. Also, I can make a music thing in the Portal only for pokemon music. I will make one for the Heart Gold and Soul Silver game music first, to see how that goes. Anyway, I will try my best to work on this stuff. Looks good and keep up the work, also great idea about the music red. I will. It may take awhile though so be prepared when it shows up. Also, I am going to go work on a logo now. Be back when I can. This is just the look of it. I haven't worked hard on that yet. I know its worse, but trust me, when I get to use photoshop again, I will make it look a whole lot better. I need someone to use this font type in the new logo for PokeSilo since im not good at it currently.